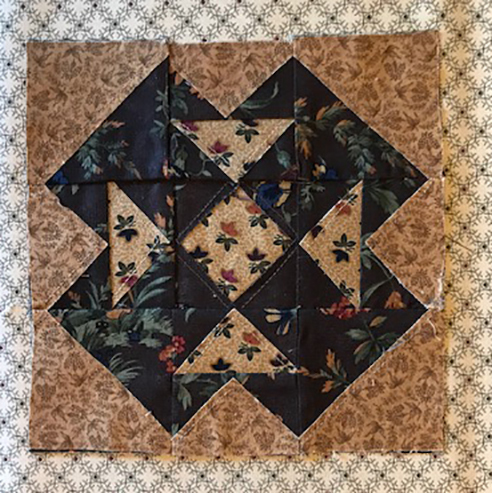 Is there a quilter whose work always inspires you? How can I pick just one? At every quilt market, quilt show and guild show 'n tell, there are so many wonderful examples of creativity and ingenuity, I'm constantly inspired by all the quilters around me. 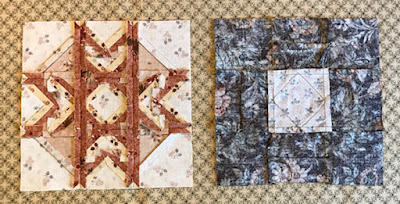 However, if I was pressed to choose one outstanding person in the quilting world, it would be Barbara Brackman. Her vast knowledge of antique quilts and fabrics is awe inspiring. 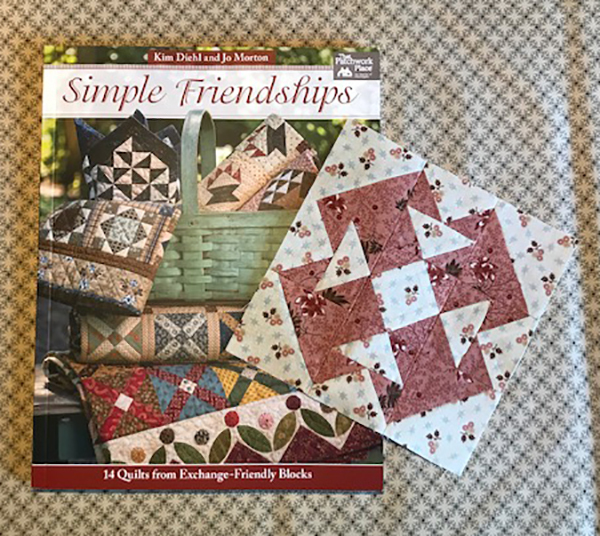 I follow her blogs to learn more about the vintage quilts I collect and the fabrics I search for to create new fabric collections. It was always a treat to visit with her at market and hear about her latest research project/book. This week's block is the T Block by Jo Morton. I've always wondered why this block was so popular in pioneer days. Were there alot of people with their last name beginning in "T"? Was it a block created for the Temperance movement? Probably a question for Barbara Brackman. Find the instructions for Jo's block below. Kathy made our traditional version with Jo's collection in pink and cream prints. Check out the new book I just received. Simple Friendships has so many great little quilts. I have a couple picked out for summer stitching. This looks like another winner by Jo Morton and Kim Diehl. 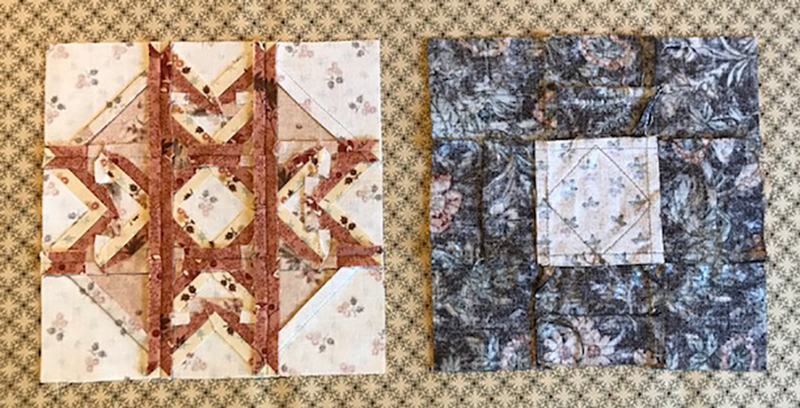 Joy made the KT Layered Patchwork option. I like that she used a different light print in the center of the T's for contrast, creating a churn dash on point. It gives the block a whole different look. There are some fun patriotic blocks coming in the next few weeks, just in time for July 4th. Don't miss a week of Moda Blockheads! I just noticed your layered technique on your blog and would like to try it out for the other blocks. Please let me know where to find your other layered instructions for the Blockheads. I found a few on previous blogs but not all. Thank you in advance. Also, to answer your question, I also am inspired by many designers. I tend to follow Pat Sloan and Bonnie Hunter's QA but love the designers of this Blockhead QA. My sewing machine dealer, Sherry Robertson, of the Sewing Bee in Jonesborough, TN runs her quilt shop single handedly and goes home at night and sews samples. I am so impressed by her expertise and workmanship. I'm excited about patriotic blocks!! Lynne, you're my favorite designer. My first quilt I ever made was made with KT fabric. I love what you do and have to have some of each line you sell. I really like Pat Sloan to pull me out of my comfort zone! Nice designs and blocks. Contrast is also out class and color variation is too professional. Contact Assignments On Web for the best assignment writing services. It always happens that we dont know on which topic we shoud write our next essay. There are 200 essay topics (luckily!) which will finish this dilemma and return our inspiration and creativity.